No issues are being worked on Atlantis at Pad 39A, as STS-125 continues to proceed towards launch in just over a month’s time. One crucial element for the May 12 launch is the replacement hardware that Atlantis will carry to the Hubble Space Telescope, with several days of mission content simulations taking place next week, which includes fine-tuning the procedures for the mission’s EVAs. Out at the Pad, Atlantis is behaving well, with Space Shuttle Main Engine (SSME) aero-surface frequency response testing performed, and blank-off plates installed in preparation of helium signature testing – which has since been completed. Preparations for hyper-load testing will begin on Wednesday. “S0009, Launch Pad Validation, is essentially complete: Ground umbilical carrier plate (GUCP) leaks checks are complete and good,” noted the latest processing information on L2. The successful installation and leak checks on the GUCP were expected, although attention will be placed on the hardware during tanking, following the issue with the opening launch attempt for STS-119 – when a large leak of gaseous LH2 was detected by sensors, once the seals were under cryo conditions. No root cause on the problem has been found, with the second launch attempt observing no leaks, allowing for a successful launch. However, confidence the issue won’t repeat is high, following the installation of the “best seal” into the GUCP hardware. “At KSC, there is an investigation going on to understand the root cause the GUCP gaseous hydrogen leak that caused a scrub for the first launch attempt of STS-119. ET (External Tank) is participating from MAF (Michoud Assembly Facility) and from MSFC (Marshall Space Flight Center),” noted the only reference on a Shuttle Stand-Up/Integration report, on L2. “(Shuttle manager) John Shannon inquired whether we sent the flight seals for the GUCP from MAF to KSC. KSC installed one, while are continuing to investigate the inspection criteria. If it has to be changed out it, can be done at the pad. With the replacement Science Instrument Command and Data Handler (SIC&DH) now installed into the MULE that will be carried in Atlantis’ Payload Bay, mission simulations will take place to work on fine tuning the EVAs that will take place on orbit. “There will be several simulations next week regarding EVA1 and EVA2; this will complete the simulation runs for STS-125/HST-SM4,” noted the Stand-Up report, referring to the three days of sims between the HST team, JSC teams, and others. Engineers will cover the first EVA (WFC3 and SICDH) on Monday/Tuesday and then Rendezvous and Capture on Wednesday. The formal terminology for next week’s activities is “Joint Integrated Simulations,” or JIS. These entail everyone involved in the mission manning their stations in a flight-like configuration, running through flight days. Also building up is the Flight Readiness Review (FRR) season, which was already complete to the point of the MOD and SSP (Space Shuttle Program) FRR from the first launch attempt last year, prior to the Hubble trouble on orbit. All STS-125 MOD and SSP FRR presentations from last year’s attempt are available in L2 to download. However, all the FRRs will be repeated, in order to align to the May 12 launch attempt, along with updating vehicle status and on orbit threats – such as MMOD (Micro-Meteoroid Orbital Debris). First up is the L-30 Bench Review for STS-125/HST-SM, which will take place on April 10. 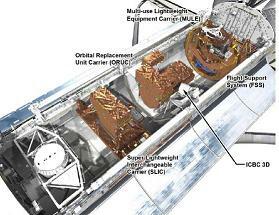 MOD will hold its STS-125/HST-SM4 FRR on April 14. The USA (United Space Alliance) in-house FRR will begin at noon on April 16. The following day, another FRR will be held with the OPO (Orbiter Project Office). Pre-SSP FRR meetings will then take place at a department level, ahead of the all-important SSP FRR, which takes place over April 20 to 21. The Agency SOMD FRR will be conducted on April 30 – which is when the launch date will be officially set. STS-125 will be the first of a surge of three launches over four months – four if Ares I-X doesn’t continue to slip, which remains likely – coming soon after the highly successful STS-119 mission with Discovery. Addressing the vast shuttle teams, Mr Shannon noted that next week’s IFA (In Flight Anomaly Review) of STS-119 will be a focal point for concentrating on the upcoming STS-125 mission. “The Team is operating at an extremely high level. We just landed STS-119/15A – and it is already way back in the rear-view mirror,” Mr Shannon noted on the latest Stand-Up report. “Be sure that we are giving the proper attention to the Integrated IFAs, so these can be dispositioned at next week’s SSP PRCB (Program Requirements Control Board) meeting.